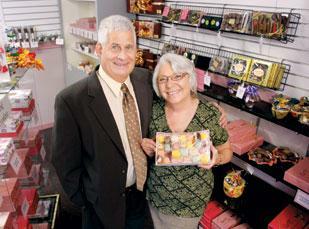 Handcrafted chocolates have been a tradition at Dorothy’s Candies since founder Dorothy Gastel opened a shop in her McKeesport home in 1947. Dorothy’s has moved to bigger quarters in White Oak, but each caramel, cherry and fudge nut center is still swirled by hand in a well of melted chocolate. This is a lot of swirling, considering the company ships 75,000 pounds of chocolate every year. Dorothy’s approach to manufacturing has fostered an artisan pride among employees. The sales and recordkeeping system could’ve also been thought of as artisanal until about eight years ago, said Marti Gastel, co-owner. Until around 2003, Dorothy’s had two computers, one for paying bills and typing the occasional letter, and another that tracked inventory and could ring up sales, providing the user could memorize hundreds of codes that represented the varieties of chocolates. Part of the problem was a dearth of software tailored to the needs of small businesses. “People who didn’t know the codes were useless, which created divisions within the workforce,” Gastel said. An intercom was used to relay special orders to the production area from the store, and customer orders were handwritten on notebook-size, four-ply books with carbon sheets. Order tracking, follow-up, inventory control — none of that was possible. Gastel and her husband, Robert, found a computer consultant who specialized in programs for small businesses. Going digital was not a hard decision for the owners, but many employees didn’t share the enthusiasm. Some left rather than change. The Gastels developed a strategy for acceptance of computerization. The effort started with a new philosophy — they called them Dorothy’s Principles — which were shared with employees, new and old. Among the principles were ones valuing individual technical skills and the willingness to teach others. The company also identified workers who took an interest in making the change, then trained them to train others, so the gospel came from coworkers rather than supervisors. When it came time for the big switch, Gastel had to put away the old order books to encourage use of the new system. Dorothy’s adopted a point of sale program, and, for the first time, the company could track customer preferences and inventory. Employees began sharing an online calendar to know when jobs were due, and orders were electronically transmitted from call taker to production. Employees often fear they will be replaced by computers, but the reality is, going digital can allow employees to do what they love most, which in this case is making chocolates, said Jim Merante, president of Monroeville-based Padgett Business Services. Dorothy’s succeeded because management was able to get the staff to understand that. “Even the smallest advantages are critical for small businesses,” he said. Computerization was phased in at Dorothy’s over several years, with tweaks continuing even today. But revenue rose 10 percent in recent years and labor costs fell 30 percent compared to the pre-computer days, positioning the company nicely to weather the current tough economy, Gastel said. Challenge: Overcoming staff resistance can be a challenge for a small company seeking to computerize sales, manufacturing and warehousing operations. Solution: Fostering a work culture that values computer skills while identifying and encouraging employees who will champion the transition can help overcome employee resistance.